One of my friends was sorting out all the various formats and weighing the value of each one. I know this is debatable (and I kind of disagree with him) but he concludes that the best one was MPEG-1. It satisfies each of the criteria factors … fairly. Meaning, it is mediocre all around … but not really stellar. What’s great is that nobody needs to download a codec. MPEG-1 compatibility is built into 99% of all video players! While most players can play *.mpg files, it is difficult finding a compression program to actually create such a file. I guess software makers assume that it is an ancient format and that playback functionality, alone, is sufficient. They may be right, but I don’t see anybody getting rid of the *.gif format anytime soon! Fortunately, there are a few programs with MPEG compression that still exist. The best one I found is TMPGEnc. 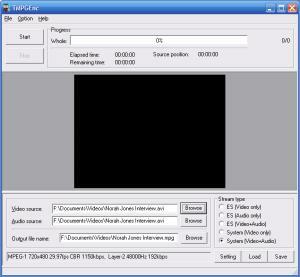 Like the DivX converter, it works like a dream; straightforward and easy. You simply specify the input video and audio file (if both streams are separated), set the quality, and start the conversion! For the really n00b types, you can use the wizard instead what with the basic pre-configured compression profiles. One tip, turn the preview function off. Unless you want to see your video in super slow motion, you’re really wasting processing power. The one drawback I can think of is that TMPGEnc only accepts *.avi files as input formats. So, you have to find a way to convert your file to *.avi first before *.mpg. I don’t know … To me, that’s unnecessary double work and time. Does anybody have other suggestions? Feel free to leave any comments, questions, or suggestions below. Check back next month on how to convert the other way around from *.mpg to *.avi! This entry was posted on Wednesday, September 26th, 2007 at 3:32 pm	and is filed under Audio and Video, Utilities. You can follow any responses to this entry through the RSS 2.0 feed. You can leave a response, or trackback from your own site. great stuff! =) easy UI and great options! =) 3 thumbs up! I’ve been using “Any Video Converter” free version (http://www.any-video-converter.com/products/for_video_free/), which I’ve found actually will convert ANY video - flv, vob, mpg, avi, into your choice of avi, mpg, mp4, or other formats. It has a friendly GUI, and several compression and quality options. I like it better than DivX, Dr DivX, WinAVI, or some others, which are only “kind of” free until you need a specific codec or choose a certain option, then get the “download full version” message which takes you to a page where you have to pay. While there are “pro” versions of Any Video, I’ve wondered what they might do that the free version doesn’t, unless you’re SERIOUSLY into audio/video and a “pro” yourself. It only asks if you want to upgrade AFTER finishing a conversion. I use mine to convert avi to NTSC mpg-2 before putting THAT file into Nero to burn to DVD; Nero makes a much bigger mpg, which sometimes won’t even fit onto a DVD, whereas Any Video can sometimes make them small enough to get two, or even three, on one disc, and with MUCH better quality (and sound) than Nero does on it’s own.